Laplace transforms and their inverse are a mathematical technique which allows us to solve differential equations, by primarily using algebraic methods. This simplification in the solving of equations, coupled with the ability to directly implement electrical components in their transformed form, makes the use of Laplace transforms widespread in both electrical engineering and control systems engineering. This note is a recap/review of Laplace theory and reference which can be used while carrying out day to day work. It is not an introduction or tutorial and does assume some prior knowledge of the subject. In finding the inverse transforms, it is helpful if the equation to be solved is expressed as a sum of fractions. Partial fractions are a way to achieve this and the process is called resolving partial fractions. Example: consider a series circuit consisting of a resistor and capacitor as shown. 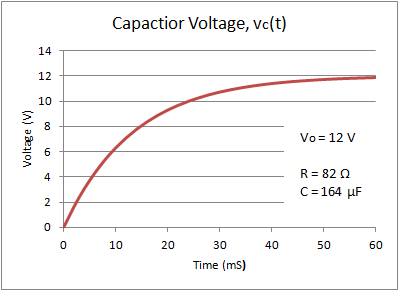 A step voltage v(t) equal to V0 is applied at time zero. What is the form of the voltage across the capacitor, vc(t).